Advance Lifts is a leader in the design and manufacture of engineered Dock Lifts, Rail Transfer Bridges and Truck Levelers. Since 1974, "engineering excellence" has been the hallmark of Advance Lifts products. Over the last few years, we have intensified the research and development program at Advance Lifts and the value gap between our products and our competitors has increased significantly. Recent innovations include our "Ultra High Cycle" lift with a 3,000,000 cycle warranty, the only lift of its kind in the industry. We have been advancing the "state of the art" in lift performance at a dramatic pace. The point of all this research is to provide customers with superior value and service. Some of our breakthroughs can be applied to many of our standard products, while others are reserved for custom high performance applications. Regardless, our knowledge base is available to you and we hereby invite you to put Advance's engineering expertise to work for you. Dock lifts are designed and built as an integrated torsionally rigid structure. The base frame has a wide stance to provide maximum support. The scissors legs are tied together with torsionally rigid torque tubes. The platform is a box beam design, which adds to the torsional rigidity of the entire structure. 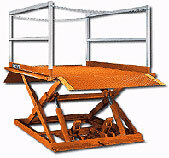 Pit mounted lifts offer the most sizes and options. They are among the most frequently used dock lifts. 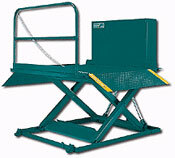 These lifts are installed in a concrete pit in the ground or a pit in a raised concrete dock. Platform sizes from 6' x 8' to 8' x 12'. 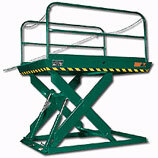 Portable dock lifts allow you to easily set up and move a lift to suit your operation. The lifts feature a wheeled dolly handle that lets you move the lift wherever you need it with optional transport wheels. Enjoy the convenience of a dock lift without the expense of a concrete pit. That's what you get with surface mounted dock lifts. This 5,000 lb. capacity dock lift gives you the lowest lowered height while letting you handle any type of loads moved by manual material handling equipment.